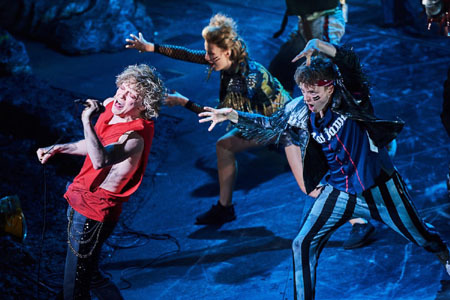 With new songs written by Jim Steinman, this musical production of Meat Loaf's Bat out of Hell, which opened in Manchester in February finally made its West End debut at The Coliseum in London on Tuesday night. The cavernous space is home to the English National Opera but was maybe the only place large enough to house a mammoth set, which is at times the base of a Shard-like tower and at other times, a subterranean cave system. The story is frankly bizarre, with a character called Strat (yes, really) leading a gang of eternal teenagers called The Lost through a dystopian Manhattan - now called Obsidian -run by a former rocker-come-despot called Falco. Trying to make sense of the plot is probably not worth it, as the cast thunder through Meat Loaf's back catalogue, including Two Out of Three Ain't Bad, Real Dead Ringer For Love, You Took The Words Right Out of My Mouth, the title track, of course, and the inevitable show closer I Would Do Anything For Love. It's all a bit of a guilty pleasure - a rather large cheese sandwich - but the standing ovation proved that there is life in the old Loaf yet. So our reporter Kev enjoyed it - and it seems plenty of other people have too, as the musical has added two further weeks of shows - with tickets on sale now. 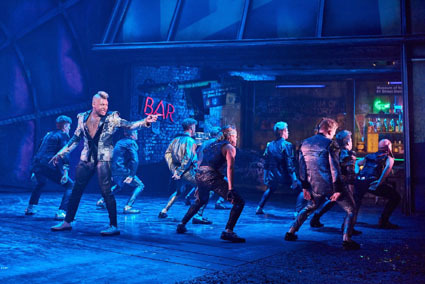 In other reviews, The Guardian said: "Jim Steinman's perky lyrics are often overpowered in this musical juggernaut, but his roaring choruses and fairytale plot are built for the ENO’s stage"
While the Evening Standard described the show as "a jaw-dropping spectacle". So don't be sad Jim…three out of three (good reviews) ain't bad.